The hotel is very central to the centre of Exeter. It’s a short walk past the cathedral and a stones throw to the Princess hay shopping mall which is an ideal location for anyone staying for leisure or business. We caught the train up from Plymouth and from the station itself it only took us about 20 minutes to walk in. As you can see from my first picture the entrance and lobby is so grand and it was beautifully decorated for Christmas as you can see. We even received a text beforehand to let us know that our room was ready for check in and there were bowls of delicious Christmas chocolates around the hotel for check in, another lovely personal touch to our stay. We stayed in a Privilege guest room which was nothing short of luxurious. The Privilege room includes a few little extras including a complimentary newspaper, free wifi which actually worked which was great, so many hotels I’ve stayed at claim to have it but it never works so that definitely did impress me! There was also a bathrobe and slippers and a selection of free refreshments and a coffee machine! We also had a stunning view overlooking the Cathedral, we really could not have asked for a better room to be in. I am still yet to try breakfast room service anywhere, probably because I’m greedy and end up eating much more than if you ordered it to your room. But it’s definitely on the bucket list and it is good to know that the option is there. The bathroom was really spacious and I love the colour scheme with the tiles, you can definitely tell that the privilege rooms are built in a modern and contemporary style as the website states. In the bathroom we were left with a generous selection of bath and beauty goodies, they literally did cover everything from toothpaste to shoe shine, I always end up forgetting something when I go somewhere for the night so the Mercure definitely have that covered! After checking in to our room we headed down to the leisure facilities. There aren’t many hotels that offer this kind of facility, in Exeter anyway. There was a heated pool which I would say was about 20m in length, a jacuzzi, sauna and fitness suite. It was so relaxing after arriving to jump in the pool having worked all day, well all week for that fact and it really did feel like I was on a holiday and that I was much further from home than Exeter! As it was the weekend before Christmas it was really hard to find a restaurant where bookings were left. Because of this we decided to book into a place which wasn’t a chain but turned out to be one of the nicest places we have eaten at, it’s so refreshing to eat at an independent restaurant for once and I always feel they make much more of an effort. It was called On The Waterfront which is a pretty self explanatory name and it is spotted on one side of the canal which was again only about a 5 minute walk from the hotel. From the outside the restaurant just looked like an ordinary pub but inside it was like a cave with pretty lights lining the walls, it was so relaxing. 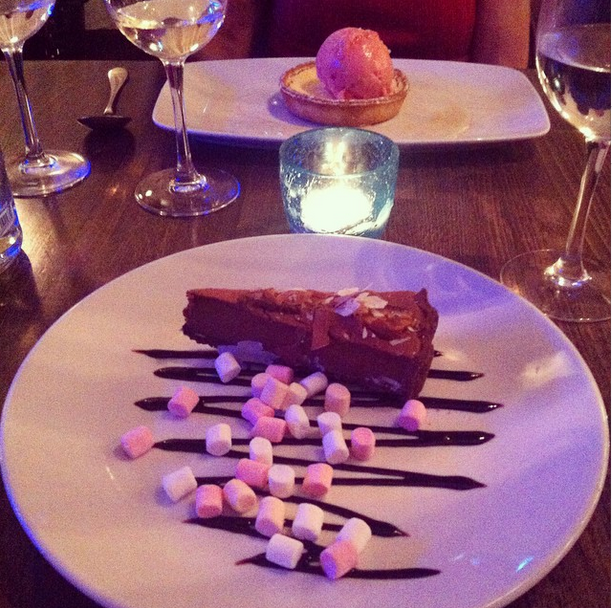 My dessert was literally amazing as you can see above, I had chocolate junk yard, I could so eat this again right now! They are most well known for their pizzas which looked and smelt amazing, I would recommend this place to anyone. In the morning we went down for an early breakfast in preparation for the busy day of shopping ahead, I managed to take some more pictures of their gorgeous Christmas decorations leading on to the breakfast room. 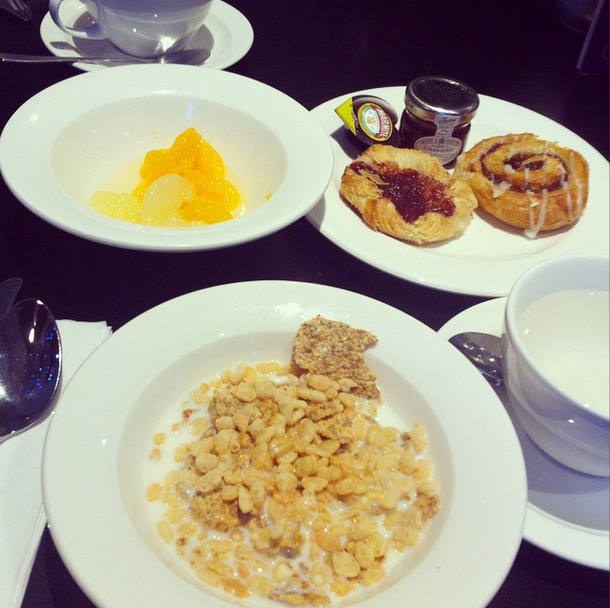 Hotel breakfasts are always the favourite part of my stay and this one in particular was definitely one of the best that I have had. There was an extensive selection of hot foods as well as the continental breakfast including cereals, fruits, cheeses, breads yoghurts and lots of delicious pastries, it would be rude not to! Again it was a relaxing experience, the breakfast room was beautifully decorated and the staff attended to our every need. In the morning we had a stroll around the cathedral and of course checked out the Christmas Market. I’ve seen a few Christmas markets this year as well as visiting Winter Wonderland in London and can honestly say this was the nicest one that I’ve visited. It was really nicely laid out, there was plenty of room to walk around and the location of it next to the cathedral was so pretty. During the day we were also planning on visiting the underground tunnels in Exeter which is a really fun thing to do, I also did it about 10 years ago. Unfortunately we didn’t have enough time as someone (*me*) still had Christmas shopping to do, the weather wasn’t also that great during the day but if you ever find yourself in Exeter I would fully recommend a visit to the tunnels. Apart from that everything to do in Exeter really is free and you can still have a great time! I love the old streets in Exeter. The Christmas market was beautiful at night time, we passed it on our way to the hotel on the Friday and revisited on the Saturday to properly have a look around. Forever drawn to the cupcakes at Christmas markets, mmm.. These are sooo adorable, I actually regret not picking one of these up to put outside our door at home. On the Saturday afternoon after a busy morning battling the crowds we headed back down to the canal where we had been the previous night which was a much welcomed change and rest from the hectic crowds. It was so peaceful and was just a perfect way to end a relaxing weekend with a long walk around the canal. Along the canal there were lots of different little shops in what appeared to look like caves, selling lots of lovely vintage, shabby chic and reworked items. The best thing was that there was hardly anyone around so we could browse to our hearts content. I loved this little Christmas tree made out of driftwood! Before heading home we popped into a HUGE tk maxx which literally had everything, apart from the dune shoes in my size!! But even that couldn’t ruin my amazing weekend away in Exeter. I really did have the nicest weekend in Exeter and I wish I could redo it all again! A big thank you to the Mercure Southgate Hotel for helping my mum and I to have such a relaxing stay, despite being in the centre of the city the hotel was so quiet at night time and we were not disturbed once, our stay really was nothing short of perfect. The location, facilities and staff definitely make this a hotel worth staying at and I will definitely be revisiting again in the New Year! Despite only being 45 minutes away from home it felt like I was on holiday and it is something that I will be doing more often in the New Year as I had such a good time, staying in a hotel not far from home really is refreshing! Have you visited Exeter before? Would you stay in the Mercure Southgate Hotel? Would you like to visit Exeter? Next Post December Degustabox Review & discount code!